A document that addresses the reception of Holy Communion which can be interpreted differently in Germany to in Poland, from Diocese to Diocese and eventually parish to parish is an unmitigated triumph for Cardinal Marx and Cardinal Kasper. As far as they are concerned, the Polish Bishops can do whatever they like. It's not their problem. Their problem is overseeing the decline of the German Church and presenting it as a success. It is a triumph for them as well as for all those other Bishops around the World for whom the issue of Holy Communion for the faithless, for adulterers and for all they cannot bring themselves to call to repentance for lack of spine and for love of money and prestige has caused them such a publicly expressed 'concern' within the Church. Not that they are concerned for souls, naturally. 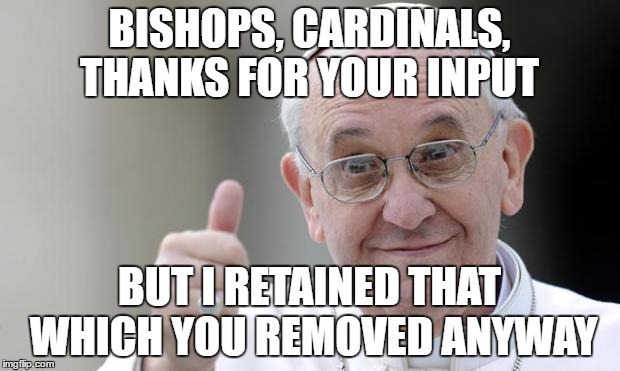 Far from bringing this issue to a close, however, there is every chance that this issue is now going to be the focus of a civil war within the Church, one overseen by the Pope and his Successors because within even countries and nations, unless individual Bishops conferences make a joint declaration, even Dioceses and parishes will, within a matter of time, do 'their own thing' based on 'their own interpretation.' Nobody - not one soul - will be able to say 'Pope said no, so end of'. So let's be clear. This is not a 'Humane Vitae' moment. Not one bit of it. 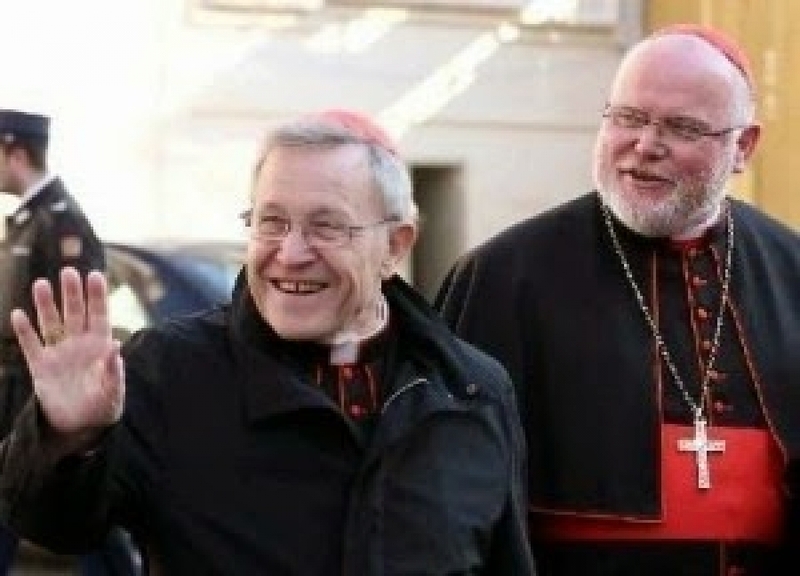 The Pope has given Cardinal Kasper and his friends precisely what they wanted. He has done what he was elected - and for which others were canvassed - to do. And if you didn't see this multi-faceted 'gem' of a tragedy coming, a travesty for the Church's catholicity, its universality, its unity, a travesty for souls, for the salvation of sinners, for vocations to the priesthood, for the clergy, for religious life, for the protection of the Eucharist, for the Sacrament of Matrimony, for canon lawyers, for the proclamation of the Most Holy Faith and more, then today should be for you the wake up call you needed. This is a war, it is ongoing and a significant public victory has today been won by those who are working to undermine Christ's Church and His Teachings by severing 'doctrine' from 'reality' by talking about reality as if 'reality' is - as soon as a couple enter a parish Church - a pastoral pseudo-reality, immovably fixed in grace-starved habitual mortal sin. In that fictional ecclesial nureality, repentance and even Jesus Christ Himself is merely an 'idea' that the Church 'proposes'. It is faithless. It is an empty shell. It is not the Faith It is a deceitful replica of the Faith, faithful only to the outward appearance of it, created by those who do not believe in the real, authentic, original thing itself. Nobody - nobody - is served by denying that what is within the document is indeed in the document, even if the most destructive parts are to be found within 'footnotes'. The document is riddled with confusing and erroneous suppositions and let us not be in any doubt that its authors intend for it to replace that which has come before. Even when Catholic teaching is stated the author is clearly so embarrassed of Jesus Christ that they must nearly reverse the sound teaching in the following assertion as if to please the faithless. There is no need for spin here from the BBC. The door to endorsement from the Pope for Holy Communion for the divorced and remarried, for those in unrepentant mortal sin, is there within the document itself. There can be no doubt that the Pope has publicly abandoned - in this document - that which he is called to defend and uphold. Nevertheless, all is never lost. There is always you and your prayers and your charity and your zeal and your love of the Truth and your willingness to proclaim it. More than this, there is always Jesus Christ, the Lord, the same yesterday, today and forever. He is still Lord of Heaven and Earth. He is still King and He is still the Head of the Church, the Body of which you are if you are Catholic. All Jesus asks us to be is faithful. He will never lead you astray even if others in authority over you might attempt to do so and do it, outrageously in His name. Cling to Him in this a day of darkness for the Church of Christ. For as surely as night follows day, so a brighter dawn will follow even the darkest of those days. Be patient. Persevere. Pray. Pray for married couples. They are under enough strain and pressure in these days as they are. Married couples need courage, encouragement, an exhortation to Christian heroism and an endless spring of spiritual nourishment and support in the spiritual desert in which we exist. The last thing married couples needed was an Exhortation to Christlessness because, let nobody be in any doubt, that's - and alas for him who signed it and they who penned it - what they just got. To be quite frank, if George Soros's Open Society Foundation had literally paid in dollars a bunch of apostate bishops, cardinals and got them to get one of his own friends elected Pope, I sincerely beliee that they could not have done a better job at undermining the Holy Catholic Faith than those who have done so with such enthusiasm today. And finally, if you think I'm being in any way hyperbolic of today's events, you can read for yourself what The Tablet say of this document. Good luck finding the quotes from the 260 page document that contradict their conclusion, if, indeed, such a quote is there. That's another problem you see. There is no robust defence of Catholic doctrine in this florid document, only an apology for it swiftly followed by what looks awfully like a compromise of it. Perhaps Fr Lombardi would like to elaborate, or are we past that stage now? Just how any Priest will be able from now to refuse those he might deem will be more damaged than healed, more condemned than forgiven by their receiving Holy Communion, without being seen to be entirely arbitrary and partisan, or unmerciful, exposed and with no recourse to the protection of the highest Officeholder in the Church is obviously something the Pope has neglected to consider. What a shocking betrayal of the clergy and of Jesus Christ the document - and the application of this document - is going to entail. For no sooner has a liberal clergyman or bishop read it, or at least its summary, will it be most likely applied. No sooner will one who is not yet in a State of sanctifying Grace, one in mortal sin, hear of this 'general absolution' will he or she seek the Holy One and mistake Him for mere bread, for if they really believed it were He, they would not dare approach the One who replied to Judas and those who sought Him, "I AM." Pray for the Church, pray for the clergy, pray for the Popes, pray the Bishops and Cardinals and pray for an end to this shameful crisis, a crisis spanning decades that today finds its most notorious fulfilment in an Apostolic Exhortation that exhorts nobody to anything, but tempts and leads many into error, sin and death. There is no debate as to who wins this war. The heel of the Immaculate will make known the triumph of her Heart and Her Son's Holy Cross. All that remains to be seen is whether we will persevere to the end in the truth praying and working for the Salvation of the World, remaining in the truth of Christ to the Glory of the Most Holy Trinity now and forever. And remember, it's still Eastertide. Christ is Victorious, allelulia! Lawrence.You are spot on in your analysis of this Devilish piece of excrement from Papa and his Forty Thieves.This has been brewing since Vat 11, remember that heretical document!.Dont despair -all this is a necessary process on the purification of the Church.Return to Tradition -i have.It is growing and will continue to grow when those hippy Heretics in Rome have gone before Judgement-Oh pray for their poor benighted souls.Well written Lawrence.God Bless. "If George Soros's Open Society Foundation had literally paid in dollars a bunch of apostate bishops, cardinals and got them to get one of his own friends elected Pope, I sincerely beliee that they could not have done a better job at undermining the Holy Catholic Faith than those who have done so with such enthusiasm today." How do we know that isn't exactly what happened? Except the foundation is probably nameless and the apostasy covert. "For the invisible things of him, from the creation of the world, are clearly seen, being understood by the things that are made; his eternal power also, and divinity: so that they are inexcusable. Because that when they knew God, they have not glorified him as God, or given thanks; but became vain in their thoughts, and their foolish heart was darkened. For professing themselves to be wise, they became fools. And they changed the glory of the incorruptible God into the likeness of the image of a corruptible man, and of birds, and of four-footed beasts, and of creeping things. Wherefore God gave them up to the desires of their heart, unto uncleanness, to dishonour their own bodies among themselves. Traddies go into predictable meltdown, same as their liberal polar opposites. We all know Frankie's not up to it cerebrally and this piece of work is just a tedious traipse around not very much. Actually, I detect the work of a number of hands, some of it is in fairness quite coherent and impressive ( Robert Bellarmine gets a word - surely you don't object) and you can see the bits where Frankie's Retreat Centre meanderings come in. It's not the Apocalypse, it really isn't, and there is no need for theological panic and the circling of wagons. That is self-indulgent of you and it's the Traddies' reflex. Thanks for the pinpoint analysis, Bones. I await the response of Bishop Fellay. The only bright spot I can see about this Apostolic Exhortation is that Francis does not attempt to claim it as infallible teaching, thank God, (though enough cardinals and bishops might). Well said Bones. Keep the faith and ignore the man in white. He can go to hell if he wants to, but we don't have to go with him. I love that song so much----I've been replaying and singing along with it over and over. Thanks so much for that! If Amoris Laetitia §305 means anything, it seems to mean that, Right, so a sin isn't a sin if I don't feel it to be a sin? Or if I can claim that in my culture/family background/state of health/gender orientation it isn't a sin? Whoopee-do, the sky's the limit now! "That's your truth and I respect it." It's a tough one: the inane formulations of the superannuated Vat 2 liberati or the graceless, stiff-necked priggery of the Church of Unending Self-Righteousness, Wrath and Damnation? In which box does the bewildered Catholic put his cross? The Church will become a small - a real community of people who will exercise the greatest gift of all: Love! There is nothing left by the Love of God and that is our fuel til the end of times - paraphrasing Paul. Pope Pious X tried to clean up the seminaries during his Papacy but failed, and admitted that the virus of modernism/nomimalism = Relativism went underground but will spread to undermine the authority of the church. Since the 1960's we have seen that doors of the Vatican were open to let 'new fresh air' and since the then the Modernist/Relativists have infiltrated it in a sophisticated manner. But this is not the end, just the beginning of a new era of suffering for the Catholics. We cannot carry this cross without your help Lord! Ave Maria Stella Ora pro Nobis¬! I must admit I am a bit disappointed with Amoris Laetitia. In spite of everything I was inclined to believe that when it came to the bit it would be just essentially clear orthodox Catholicism, albeit a shambolic waste of time. But then I am an incurable optimist and when it comes to the bit I forget my own oft repeated warning that history has not yet come to an end! Oh we do most certainly live in interesting times! Dr Droleskey's commentary is well worth taking the time to read: quote,"It is fairly clear what this means, is it not? The work of the so-called “Congregation for the Doctrine of the Faith” on matters of moral teaching is terminated." The trouble is that Christ died on the Cross to offer Salvation to all Mankind, not just the poor, or the middle classes, or the wealthy or the clergy or near-menopausals, but all. And if it becomes small, I trust we few orthodox, middle of the road, cradle Catholics, will be included. What think you?